Each time a customer walks through the door to see me I try to imagine how they must be feeling. Its not an easy thing for you to do, therefore it means so much for me to get it right. I am always welcoming, and our beautiful new showroom is warm and friendly too, to help put you at your ease. One of my first questions is to establish where your memorial will be going ie a cemetery or a churchyard as this will determine the type of memorial you will be able to have. Churchyards have very strict rules and regulations regarding shape, designs, colour and material. If your memorial is going into a cemetery you will have a lot more choice, and are normally permitted many more personal designs (ie your loved ones hobbies, favourite flowers or beloved animal). I find many people find this a little overwhelming as there is SO much choice. But….this is what I am here for. You may already have an idea in your mind that we can work on, if not I am here to help with suggestions. 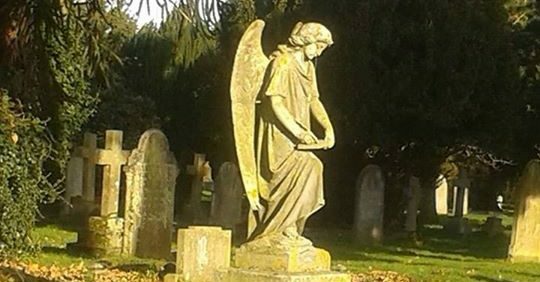 Unfortunately when people have their loved ones laid to rest in a churchyard they often haven’t been informed about the strict guidelines of the memorials and are disappointed to find that they can not have what they had set their heart on, but don’t worry….we can find something together that makes it feel unique. Whether the memorial is going in a churchyard or a cemetery application fees will need to be paid. Again, this is also something a lot of people will not be aware of. This is separate from the burial or cremation fees and is for permission to have your memorial erected only. I will deal with all the paperwork for you, you just sign and I will do the rest. Each cemetery will have their own different fees of which I can inform you of. The authorities need to make sure the memorial is appropriate regarding size restrictions and materials, and if all is permitted then they will inform me once it has been approved, but don’t worry because I will know what you can and can’t have, and if it’s a cemetery I have not dealt with before then I will find out all the information for you. Its always a pleasure to meet families and talk face to face with you, but we also understand that todays lifestyle is often hectic and so ifs its easier for you do organise everything with us via telephone and email then so be it…..and don’t worry how long its been….don’t be embarrassed if your loved one was laid to rest 20 years ago. It doesn’t matter…you are here now and im sure you had your reasons. Once you have chosen your memorial and paid your deposit we take pride in the fact that we can send you a proof layout (most stonemasons do not do this!) so you can see how it will look when it is finished and to check the spellings and dates etc. If you choose a memorial from our brochure it will take around 12 – 14 weeks until it is fitted in place, but if you purchase from our showroom it will be sooner, and can be fitted once the wording has been added and it has been approved. Added inscriptions to an existing stone will take around 10 weeks and fees will still need to be paid. We also make a wondferful job of cleaning and renovations…..email me a photo if you can and I will do an estimate to have it looking all lovely and new. I love my work…and no… its not morbid (as many people ask me)….its an absolute honour and has been for the 11 years that I have been doing it for. We are memorial consultants who work with specialists, only the best of the best will do. Having a thank you card, a telephone call or an email to say how pleased you are with our work makes me feel so proud. Please do ask me all the questions you need for your peace of mind “ITS NEVER A SILLY QUESTION”. If you have never had to do this before then how are you supposed to know! That’s what I am here for. Come and see me…..we can do this together. 2 replies to "It’s Never A Silly Question"
Situations like these are never easy. My friend is currently in this position which has lead me to your post. After reading the article I feel like I can be more helpful by recommending you, as you sound genuine and caring. How wonderful to be part of something so very personal for other people. I work on a wedding carriage and am so excited to be part of someone’s special day. I imagine it must bring the same sort of feelings, although at the other end of the journey. Having buried family members I know how important it is to have people who care doing these tasks for you.